A major challenge facing paleogeographic reconstructions of the Late Mesoproterozoic supercontinent Rodinia is identifying the extension of the Grenville orogen in continents formerly adjacent to western Laurentia (Proterozoic North America). Many paleogeographic reconstructions of Rodinia link exposures of the Grenville orogen in southern Laurentia to Late Mesoproterozoic orogens in central Australia or in the Transantarctic Mountains of East Antarctica. The Grenville Orogeny in southern Laurentia was accompanied by regionally extensive sedimentation in the interior of the continent, represented by a series of Late Mesoproterozoic basins throughout southwest Laurentia. The Late Mesoproterozoic basin system of southwest Laurentia is truncated by the Neoproterozoic rifted margin of western Laurentia produced during the breakup of Rodinia. Remnants of this basin system could be exposed on continents formerly adjacent to western Laurentia and may therefore be an important ‘piercing point’ for refining paleogeographic reconstructions of Rodinia. In this contribution, we identify a possible fragment of the Late Mesoproterozoic basin system of southwest Laurentia represented by the upper Rocky Cape Group of western Tasmania, Australia. We test the correlation between Late Mesoproterozoic strata in southwest Laurentia and western Tasmania through new field observations and detrital zircon U-Pb-Hf isotopic data from exposures of the Unkar Group (Grand Canyon, Arizona) and the upper Rocky Cape Group. The stratigraphy of the Unkar Group and upper Rocky Cape Group are remarkably similar with both successions comprising a lower subdivision of stromatolitic dolomite and siltstone overlain by quartz arenite with soft-sediment deformation features. Detrital zircons age distributions from the Unkar and upper Rocky Cape Groups are both characterized by large age peaks at 1600—1800 Ma, prominent 1450 Ma peaks, abundant 1400—1300 Ma ages, and youngest peaks at ca. 1220 Ma. The 1450 Ma zircons from the Unkar Group have initial epsilon Hf values (Hfi) of 3.76—12.95, comparable to Hfi values of 1.84—12.53 from 1450 Ma zircons from the upper Rocky Cape Group. The 1400—1300 Ma zircons from the Unkar Group have Hfi of 1.16—11.89, which is similar to time-equivalent grains from the upper Rocky Cape Group (Hfi = 1.33—12.47). The youngest zircons from the Unkar Group (1300—1200 Ma) have Hfi of -0.78—12.74 Ma, which generally overlap with the Hfi of 1300—1200 Ma zircons from the upper Rocky Cape Group, although the latter includes grains with Hfi as low as -6.26. The age distribution and Hf isotopic composition of detrital zircons from the Unkar and upper Rocky Cape Groups are consistent with derivation from basement sources in southern Laurentia including the Grenville orogen. 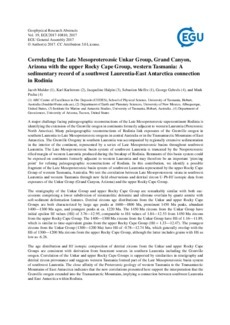 Correlation of the Unkar and upper Rocky Cape Groups is supported by similarities in stratigraphy and detrital zircon provenance and suggests western Tasmania formed part of the Late Mesoproterozoic basin system of southwest Laurentia. The close affinity of the Proterozoic geology of western Tasmania to the Transantarctic Mountains of East Antarctica indicates that the new correlations presented here support the interpretation that the Grenville orogen extended into the Transantarctic Mountains, implying a connection between southwest Laurentia and East Antarctica within Rodinia.